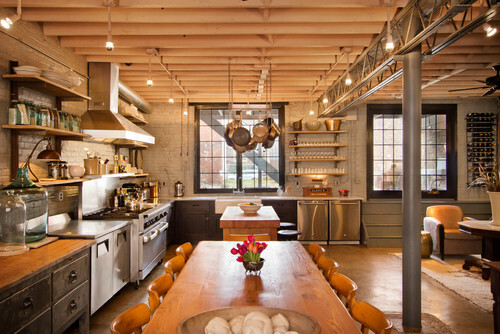 Industrial Kitchen by Silver Spring Architects & Building Designers Bennett Frank McCarthy Architects, Inc.
One of the trends in kitchen design and remodeling for upscale homeowners is to go commercial grade. Fully custom fabrications require metal experts well attuned to architecture. 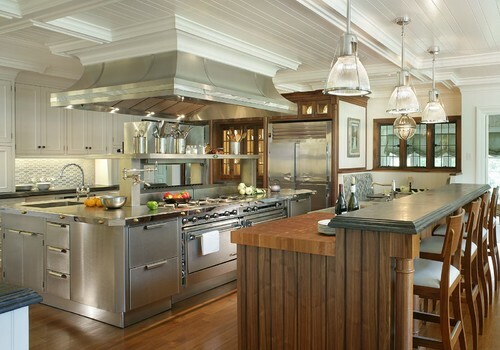 To offer clients highly customized, one-of-a-kind kitchen metal fabrications in your designs, it makes sense to talk with with an architectural metals consultant. It helps when the consultant has a track record of handling extremely unique requests with stunning results – on the very first try. It’s the metal that can sometimes stump even the most skilled builders when it comes to installing the really difficult custom fabrications. However, the creative kitchen design possibilities are endless with an understanding of modern metal formation techniques.